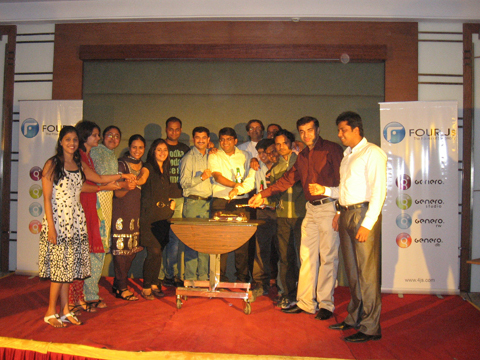 Pune, India – November 24, 2010 – Four Js Development Tools (India) Pvt. Ltd. celebrated its ninth anniversary earlier this month with a company outing to the renowned hill station of Mahabaleshwar – home to one of the few evergreen forests of the world and legendary source of the Krishna River, reportedly sprouting from the mouth of a statue of a cow in the ancient temple of Mahadev. In early 2001, Four Js made an important decision to harness the talent and growth of the Indian economy by establishing an “offshore” development and research centre there. Four Js selected Pune due to its emergence as a prominent location for IT and manufacturing, supported by a considerable education infrastructure. Pune has a wealth of IT talent and with more than a hundred educational institutes and nine universities, it has deserved its reputation as “The Oxford of the East”. Students enroll from all over the world studying at the colleges of the University of Pune. Pune has more schools, colleges and universities than any other city in the world. The College of Engineering, Pune, founded in 1854, is the third oldest engineering college in Asia. Pune is home to the Genero Studio development team as well as certain quality assurance functions for other products. The latest Application Generator, Code Analyzer and Code Editor (viemulation and XML editor) featuring in Genero 2.30 were exclusively developed by the Pune team. A sales facility was established there more recently to better service the huge business opportunity in the South West Asian region. Future business and growth plans will probably provoke a move to larger facilities during the course of 2011. Pune (Marathi: पुणे), pronounced (ˈpuːnə), formerly called Poona, also known as Punya-Nagari, is the eighth largest metropolis in India, the second largest in the state of Maharashtra, afterMumbai and the largest city in the Western Ghats. Once the center of power of the Maratha Empire, situated 560 metres above sea level on the Deccan plateau at the confluence of the Mula(Marathi: मुळा) and Mutha rivers (Marathi: मुठा), Pune is the administrative capital of Pune district. Pune is a city with its roots set far back as an agricultural settlement in the 8th century with the first town being incorporated in the 10th century. It is now recognized as the cultural capital of the state of Maharashtra and epitomizes the Marathi culture, which lays emphasis on education, arts and crafts, music, and theatre. It has emerged as a centre of modern architecture in India, with prize winning buildings. Its culture reflects a blend of traditions with modernity, along with hosting classical shows. The city also boasts an active nightlife. The oldest reference to the name Punya Nagari (Sanskrit, “City of Virtue”) was found on aRashtrakuta copper plate dated 937, that refers to the town as Punya-Vishaya or Poonak Vishaya. By the 13th century, it had come to be known as Kasbe Pune or Punavadi. Although the city’s name is sometimes transcribed as Poona in English, a practice particularly common during theBritish Raj, the spelling “Pune” has now become standard.